In this chapter we present the moment based approach for computing all real solutions of a given system of polynomial equations. 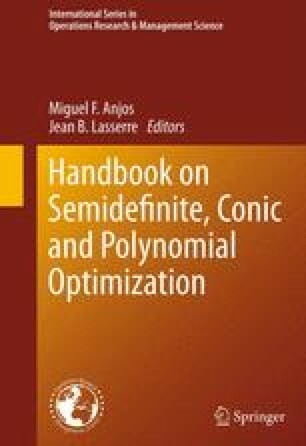 This approach builds upon a lifting method for constructing semidefinite relaxations of several nonconvex optimization problems, using sums of squares of polynomials and the dual theory of moments. A crucial ingredient is a semidefinite characterization of the real radical ideal, consisting of all polynomials with the same real zero set as the system of polynomials to be solved. Combining this characterization with ideas from commutative algebra, (numerical) linear algebra and semidefinite optimization yields a new class of real algebraic algorithms. This chapter sheds some light on the underlying theory and the link to polynomial optimization. Rostalski, P.: Bermeja: Convex Algebraic Geometry in MATLAB, Available from http://math.berkeley.edu/~philipp/cagwiki.